There are a world of different causes of back pain, some of which if we didn’t have it happen to us, we’d never even know what it was. Foraminal stenosis is one of those conditions that makes people raise an eyebrow as if to say, “what the heck is that?” Given that the majority of Americans aren’t necessarily familiar with Greek and Latin, it’s no surprise that a name like that would raise questions. I’m here to clear up at least one of those issues. 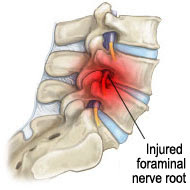 Foraminal Stenosis comes from the Latin word foramen which comes from the verb to bore a hole. Foramen refers to a hole or opening. In this instance, it indicates the hole in the spinal bones through which the nerves pass. Stenosis is Greek in origin; it’s related to words that mean narrowing, or to narrow. What this effectively means is a narrowing of the spinal canal. I’ve seen it compared to wearing a shoe that is one size too small for your foot. Eventually, the added pressure causes your foot to swell, which in turn causes more pressure and eventually serious pain. The analogy works with the spine because the swelling presses on the nerves themselves. Nerves that are inflamed and under pressure can mean not only pain, but potential disability. Foraminal Stenosis is a serious problem. A couple of the more common symptoms of stenosis of the spinal canal include numbness, tingling, burning sensations, and muscular weakness. It’s possible to have stenosis of the spine in essentially any part of the spine, but we encounter it most often in the lower back, or lumbar area because of it’s major role in load-bearing activities. It should be noted that not all cases of Foraminal Stenosis are critical, but the potential for nerve death and muscular atrophy can be a concern in those cases. It’s best to have it checked out by a doctor - just in case. And in the event there is major pain, seeing a doctor who is familiar with conditions like these is your best bet. 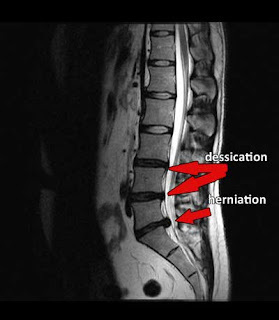 At Living Well Medical in NYC, we see patients with conditions like stenosis and herniated discs all the time. Using a combination of treatments like Cox Flexion Distraction, an advanced chiropractic technique, and spinal decompression therapy, a non-surgical treatment that actually increased the vertebral space to relieve pain. Don’t hesitate to call on us if you are in pain at 212-645-8151.